The terror alert level for five financial institutions in New York, northern New Jersey, and Washington D.C. has been lowered from orange to yellow. Homeland Security Undersecretary James Loy says the alert level was raised August first, after so-called "casing files" were discovered in Pakistan. Loy says this was the first time the Department of Homeland Security issued a targeted increase in the terror alert level, affecting specific cities and specific locations. He says it worked well, and might be used again in the future. The reduction from orange to yellow, the midpoint on the government's five-level terror warning system, comes three months after the alert was raised amid concerns the institutions could be al Qaeda targets. Yellow is "elevated," while orange is considered a "high" threat of attack. 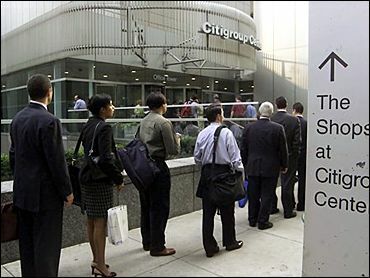 The five financial institutions in question were the Citigroup Center building and the New York Stock Exchange in New York; the International Monetary Fund and World Bank buildings in Washington; and Prudential Financial Inc.'s headquarters in northern New Jersey. The rest of the nation remained at yellow, the current threat level. The increase in the threat level for the financial institutions came after officials said they had intelligence indicating al Qaeda had conducted surveillance of the buildings. Counter terror officials later acknowledged that much of the intelligence was at least several years old. However, they defended their decision to raise the alert because of al Qaeda's record of extensive planning and plotting. Officials were particularly worried about the possibility of an al Qaeda attack using a car or truck bomb, but did not rule out other possibilities. When the nation is at heightened alert, state and local homeland security officials, along with relevant members of the private sector, take added precautions such as adding patrols at ports and increasing undercover officers monitoring potentially attractive targets. New York officials have chosen to keep the city at orange since the Sept. 11 attacks, even though the rest of the country has been at yellow most of the time. New York City Police Department spokesman Paul Browne said Wednesday's announcement by Homeland Security would not change the city's status. "We remain on orange alert as we have since 9/11," he said.